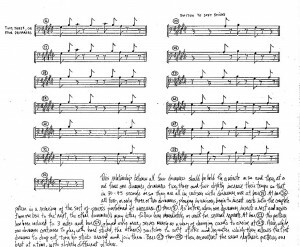 As a demonstration of instrument families, it’s hard to better the writing of Steve Reich as an exemplar. 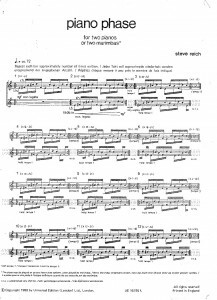 Here are a few examples of Steve Reich’s composing, which until about 1973 was almost entirely based around homogenous groups of instruments. Although it’s not strictly relevant, as a taster for what was to follow, have a listen to the opening of his 1966 hit ‘Come Out’. The first phrase is taken from an interview with a Harlem youth wrongly convicted of murder (later acquitted), and the phrase ‘Come out to show them’ is lifted from a recording of that interview. It’s then looped and played on two separate tape machines, with one running slightly slower so that the music phases. More things happen later in the piece, but they’re not relevant here. I strongly recommend listening to this on headphones. This leads us to Piano Phase, written in 1967 (also called Marimba Phase when it’s played on two marimbas). The same phasing effect is used, but this time performed live. Two players play identical music but after a short while, one of them speeds up almost imperceptibly until he or she is an agreed number of beats ahead. Here’s the opening of the piano version. A few years later, in 1971, Drumming emerged. 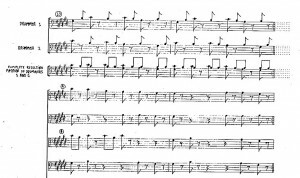 Now the phasing is combined with his technique of gradually building up rhythms by an additive process, most clearly shown in the opening passage. Four percussionists play four pairs of bongos, tuned to the same four notes. 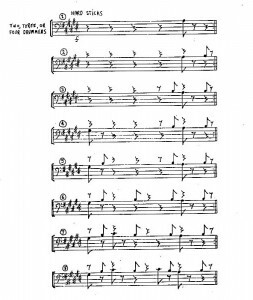 They begin by gradually building up a unison rhythm, moving to the next bar only when all four players have joined each rhythm. Any player can move at any time, but must always then wait for the others to catch up. When the full aggregate rhythm has been built up, two players drop out, leaving only players 1 and 2. Player 2 phases – playing slightly faster than Player 1 – until he or she is a crotchet (quarter note) ahead. At this point, the score becomes a little confusing. That nice Mr Reich shows Player 1, then Player 2, then – for information only – the composite parts of Players 1 & 2 added together. Then, he gives four sample patterns that can be drawn from that composite pattern. When Players 3 & 4 have sufficiently expressed themselves through the medium of bongo they drop out, and the process is repeated, with Player 2 now phasing to be a further crotchet ahead. This brings a new composite rhythm and a further opportunity for Players 3 & 4 to find their inner bongo. Here’s what that all sounds like, just up to the point of the second bit of phasing. Later on in the piece all four players are playing the same rhythm but starting at different points. On a signal, they all phase to Player 1. Having done that, they take the unison rhythm apart note by note, swap to soft sticks, and create a new unison rhythm with a different barline. Nice, huh? On the recording I have, the first movement – bongos only – lasts for 17 mins 30 seconds. That’s a lot of bongo love. 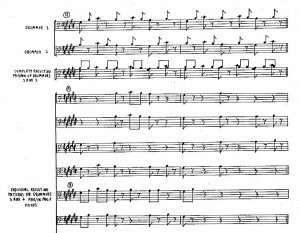 Almost in reaction to that, the following year, 1972, saw Steve Reich’s simplest piece yet; Clapping Music. 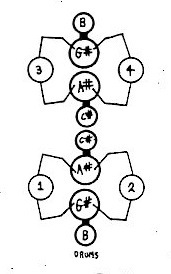 This is a reduction of the phasing technique to the absolute essence; one rhythm played against itself, starting on all 12 possible places in the bar. This is the starting rhythm; technically in 6/4, but could also be in 3/2 or 12/8. This ambivalence over the underlying pulse explains the odd beaming of the quavers (eighth notes). Finally, of these excerpts, Music For Pieces of Wood from 1973; this combines the phasing technique with the additive rhythm technique. Five pairs of claves combine to make an audiologist’s nightmare and to increase sales of ear plugs worldwide. Player one plays a constant crotchet (quarter note) beat and after a few repeats, player two joins. He or she only plays three rhythms during the entire piece; the first is the rhythm from Clapping Music. Player three joins, adding one note at a time, repeating each bar as often as he or she wishes (the score indicates 8-12 repeats, but frankly that’s in breach of the Geneva Convention). The full pattern that player 3 reaches is identical to that of player 2, but displaced by two beats. Player 4 joins, adding notes in a similar manner, then player 5. Player 4’s complete rhythm is identical to that of player 3, while player 5 matches that of player 2. The whole process is repeated with two more rhythms, each shorter than the previous. The tuning of the claves is specified; player 1 is D# an octave above the others, while the other four pairs are tuned A, B, C# and D#. 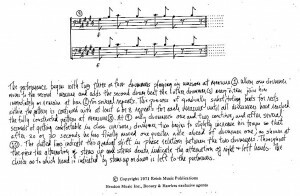 The claves for players 2-5 are of a softer wood than conventional Cuban claves – Steve Reich calls them ‘African’ claves, and the lower pitch is helped by the carving out of the underside of the middle (this shifts the nodal points further apart). Here’s an electronic sampled version. Sorry about the sample quality… repeats are cut down to demonstrate the additive process. Don’t expect to enjoy the vibe. At this point Steve Reich’s compositional style changed, to become more interested in ensembles of mixed instruments, and to return to experimenting with electronics, now aided by the development of samplers. Many of the compositional tools remained in place, though.